"The Other Side: Reflections of Reality in Fiction": Be a Ninja! The Writer's Dojo is returning to its roots and invites you to join in on the fun! When I first started the writer's dojo in 2008, I did it as a way to keep the glory of National Novel Writing Month alive all year long. I loved the camaraderie and support I received during the month of November and desired that same feeling of community every month of the year, in every aspect of writing--not just the drafting. Beginning February 1st, 2013, the writer's dojo returns to its roots and ushers in a new age of ninjawesomeness. Each month we will open three training rooms at the writer's dojo website. A room for drafters (Writing Month, aka WriMo), a room for revisers (Revising Month, aka ReMo) and a room for those querying (Querying Month, aka QuMo). We invite you to set your own goals, whether it's to write a thousand words a day, revise ten pages a week, or submit twenty queries in a month, and register your goal in the appropriate training room. 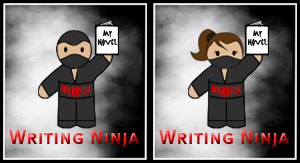 Every Monday we'll post the leaderboard for the previous week, and at the end of each month those who met their goal will be able to post the coveted Writing Ninja Warrior badge on their blog or website. CHATS: At the dojo every Thursday at 4:00 p.m. Eastern time. TWITTER: Anytime, day or night, at #writingninja. GOOGLE+: Join our community for random write-ins and sprints. NEWSLETTER: Subscribe to our Ninja News and once a month you'll receive an email with an encouraging note and a list of the top performers for the previous month. There will also be opportunities for giveaways, starting with February's newsletter! We hope to see you at the dojo as you reach for--and achieve--your goals!